The €1.6M fund is the largest of its kind to be invested in Ireland’s social enterprise sector. 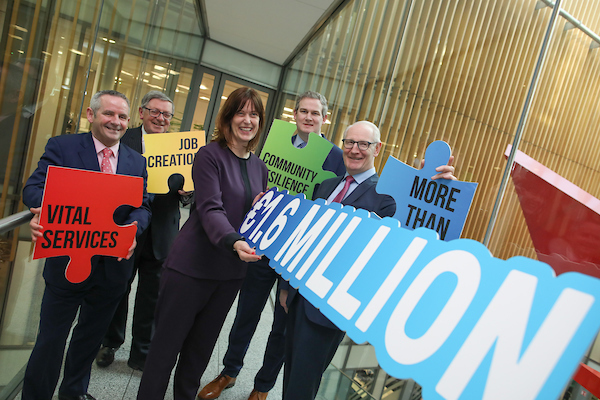 A new €1.6m fund to support social enterprises in Ireland has been established by Social Innovation Ireland (SIFI), in partnership with Local Authorities of Ireland and funded by the Department of Rural and Community Development, from the Dormant Accounts Fund and IPB Insurance. Called the Social Enterprise Development Fund, the fund will be delivered over the course of two years and up to eight successful applicants will each receive a grant of €50,000 to invest in growing their organisation. Deirdre Mortell, CEO, Social Innovation Fund Ireland said: “Over the past two years Social Innovation Fund Ireland granted €2.475 million in supports to social innovations in education, homelessness, health and positive aging. This is our sixth fund and builds on our past successes in supporting enterprises that are tackling social disadvantage and exclusion. The Social Enterprise Development Fund will allow successful applicants to grow sustainable enterprises that are rooted in local communities and create solutions for a better Ireland. We are delighted to partner with the local authorities and their mutual insurance company, IPB, in launching this fund.” Social enterprises tend to be set in the heart of rural and urban communities. Typically, they provide local services, such as tourism services or social services, and so jobs are created in local communities, providing an important economic impact. In addition to job creation, social enterprises create significant social impact through service provision in sectors such as childcare, eldercare, home help, recycling, and others. They play a particularly important role in areas of market failure for social services such as in rural areas.